Alpha Productions is the largest student run PR firm in the state of Florida. They recently began working on completely rebranding their entire organization. 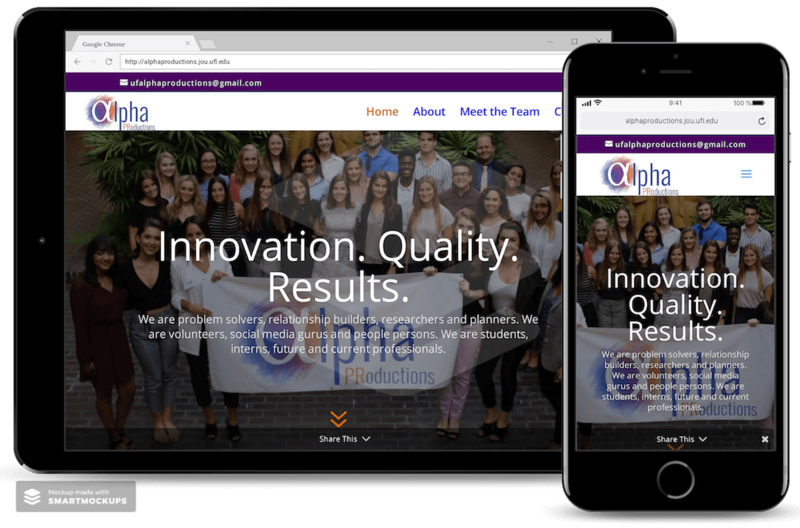 Alpha Productions needed help with a website that matched their organization’s rebranding period. They wanted something more fun and exciting, but also had a serious and professional tone. I sent personalized videos to my client to show her how to use WordPress and update her site in the future. Alpha productions was a lot of fun to work with. I enjoyed hearing about their mission, and I’m so glad I got to be apart of something like this. Not everyone goes to college and joins an organization to help other businesses like these men and women do. They do great work! Take a look at my recent work. I hope you enjoy it as much as my clients do. If you have questions, need a quote, or want advice for the next step of your website, please feel free to contact me anytime. I would love to help you on your journey to make your business flourish! My goals for this partnership are simple. I want to give you a website not only you will love, but your customers will be able to access with ease and elation. I want to build our relationship on trust, honesty, and transparency. No stress, no hassle, just excitement on growing and improving your business!